In volume 46, number 1, George S. Tate finds deeper meaning in D&C section 138 by placing it in historical context—the First World War, the 1918 influenza pandemic, and Joseph F. Smith’s loss of a son. Poet Dixie Partridge is both a poet contributor and a subject of study in an interview. Research on the “Mormon outmigration”—the migration of young Latter-day Saints from the western United States to other areas of the country—has been collected by G. Wesley Johnson and Marian Ashby Johnson. Fred Woods gives context and analysis to LDS convert Agnes O’Neal’s 1863 letter from West Virginia to Brigham Young pleading to be remembered on the rolls of the Church. 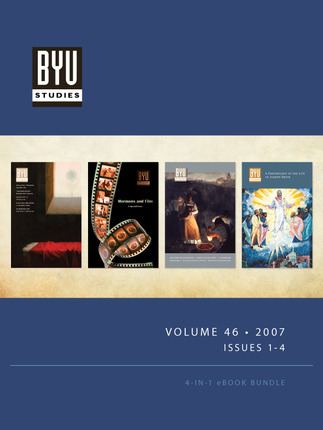 Volume 46, number 2, is a special issue on Mormons and film, featuring a major article by Randy Astle and Gideon Burton telling the history of Mormon interaction with film from 1905 to 2007. They discuss portrayals of Mormons in film (both positive and negative), Mormons in the film industry, the use of film by the institutional Church, and independent Mormon films. James d’Arc examines portrayals of Mormons as vampires, specifically in Trapped by the Mormons. Terryl Givens explores paradoxes in Mormon culture, and film in particular: searching and certainty, the collapsing of sacred distance, and Zion as both paradise and exile. Sharon Swenson shows how movies are not simply entertainment but affect human relationships and interior life. Travis Anderson shows how avoiding evil in film and art is not enough, but seeking after godly in the arts can teach and inspire us. In Volume 46, number 3, Bruce A. Chadwick and others present “A Survey of Dating and Marriage at BYU.” In 2002, the authors conducted an extensive survey asking BYU undergraduates about their attitudes and practices in ""hanging out,"" dating, and deciding to marry. Julie K. Allen and David L. Paulsen present “The Reverend Dr. Peter Christian Kierkegaard’s ‘About and Against Mormonism’ (1855).” This document publishes for the first time in English a polemical tract written by the brother of the famous philosopher Søren Kierkegaard. An article by Max H Parkin examines the United Firm, a business Joseph Smith established to oversee Church properties and commercial interests in Ohio and Missouri, including addresses misunderstandings that have persisted in the Church because of pseudonyms that were inserted into Doctrine and Covenants section 104. Volume 46, number 4, contains a comprehensive chronology of the life of the Prophet Joseph Smith that allows readers to track his activities week by week and year by year in his various roles as prophet, revelator, family member, citizen, city builder, public speaker, and religious leader. Seeing his life as a single sequence helps readers to place the events of his life in interesting contexts and to uncover various connections and interrelationships. The color-coded entries in this chronology categorize the Prophet’s activities and show trends day by day.